The word “chowder” has such a North American ring to it. You don’t seem to get chowders much in the UK, which is a shame because its a perfect match for the English climate and local ingredients. 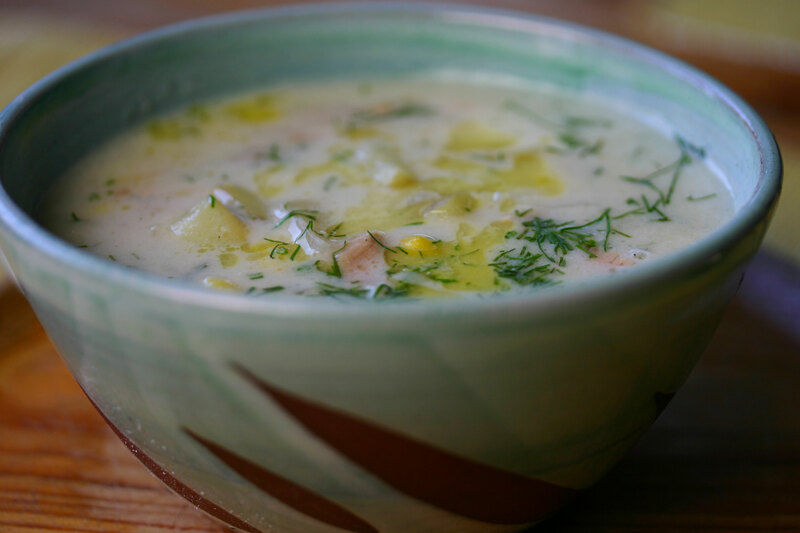 There is nothing fancy about this tuna chowder – just potatoes, onions, tuna, corn, dill and milk, transformed into something supremely tasty and satisfying. This tuna chowder is thickened with flour – a technique I seldom use these days, usually opting for cream instead. But I like the flour here – it seems right. And it turns out chowders were originally thickened with crumbled crackers or ship’s biscuit, so it’s authentic as well. Drain the oil from the tuna into a large soup pot. Add the onions and fry slowly, until soft and golden. Add the potatoes and cook for a few minutes more. Season with salt and pepper. Add enough water to cover the vegetables by about an inch (this is about three cups with my soup pot). Bring to a boil, then reduce the heat and simmer for about twenty minutes, or until the potato is tender. Add the milk, corn and dill, then slowly reheat the soup to a simmer. Whisk the flour with half a cup of water (or add them to a jar, put the lid on and give it a good shake). Add the flour mixture to the chowder, and stir until the chowder thickens. Excellent with baking powder biscuits. Great piece today Andrea. I love the idea of Fern transferring the chowder to a tureen to make you kids all feel special, as you said. Bless her! Hi Andrea. So much to say, but I’ll try to stay on topic…I’ve been wandering around this site reliving some great childhood memories – I remember making tuna chowder and baking powder biscuits with you when we were about 9 or 10 and transferring the soup to the tureen. I was in awe, as was often the case at your house, a serving bowl with a lid! It all seemed so sophisticated. You sure eat well – a long way from Heinz spaghetti surprise!